Mexican vocal artist, composer and interpreter who bases his work on vocal improvisation, Mexican traditional music, free jazz and chamber music. His voice is driven by the strength of his inner universe, and nurtured by diverse influences and singing techniques. In his beginnings, between 1995 and 2001, Villa wrote and sang songs accompanied by guitar or piano. These songs of his became popular in the Mexican song scene. During this period, he recorded Toricántaros (1999) accompanied by German and Francisco Bringas, who arranged Villa’s songs with the influence of oriental music and jazz. In this recording, there is voice, wind instruments and percussion improvisation, which since then made evident the tendency for the following works of this composer. In 2016, he started as choir director in the presentation of the Coro Acardenchado, a project that was born to celebrate and pay tribute to the almost extinct music tradition of Canto cardenche. 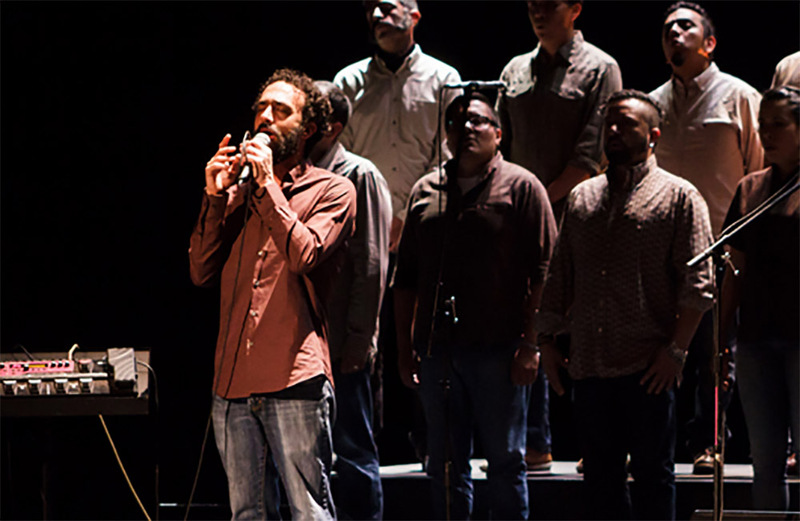 The choir is an assemble of 30 mixed voices on stage, that unites the tradition with contemporary music arrangements by JPV, Tareke Ortiz and Leonardo Soqui. The choir performed for the first time on October 1st, in a concert to honor Los Cardencheros de Sapioriz, and is currently promoting its first record “Aquellos Otros”, 2017. He has performed in Japan, China, South Korea, Austria, Belgium, Spain, Czech Republic, Brazil, Dominican Republic, Colombia, Mexico and in the cities of Houston and New York in the US. He has been awarded with the Scenic Creators grant from the Mexican National Fund for the Culture and the Arts (FONCA), in 2009, and with the artistic residences AIR Krems, 2011 and 2012, and in Nanto, Japan, also in 2012. He was awarded in Pantalla de Cristal 2015 prizes “Best soundtrack” with Alonso Arreola and Vladimir Medina, Esperanza Verde “La Raíz Doble” conducted by Mardonio Carballo, Canal 22.